Successfully Added Solar Powered Decorative Fountain “Lotus Leaf” – Floating, Submersible, With Water Pump, 7V, 1.4W to your Shopping Cart. Looking for a creative way to decorate you garden, terrace, backyard pond or pool? This solar powered fountain will get the job done — and at no extra cost to you. Featuring a 7V solar battery, the fountain is completely self-sustainable. You won't even need to turn it on or off — “Lotus Leaf” does all of that automatically. A water fountain is one of the most pleasant additions one can make to a garden or backyard. The sight and sound of moving water is relaxing and even meditative. It will make your garden or terrace a tranquil place, perfect for regaining your piece of mind after a busy working day. Adding a cool stylish element to your garden or outdoor terrace has never been easier. This solar powered fountain will take care of itself, floating around in a pond or pool, amusing you and your family with a mini water performance. Made with a highly-efficient 7V solar panel and featuring a brushless pump, the fountain is fast to start up, efficient and reliable. It effortlessly floats on water and requires no external power source. The fountain comes with 4 nozzles, letting you vary the height and pattern of the water jet. Thanks to the convenience of solar panels, you can place the decorative fountain anywhere in your garden or backyard to bring it a refreshing look. No need to worry about annoying wires, cords and electricity. The fountain would also look great in a bird bath, large fish tank, small pond and more. 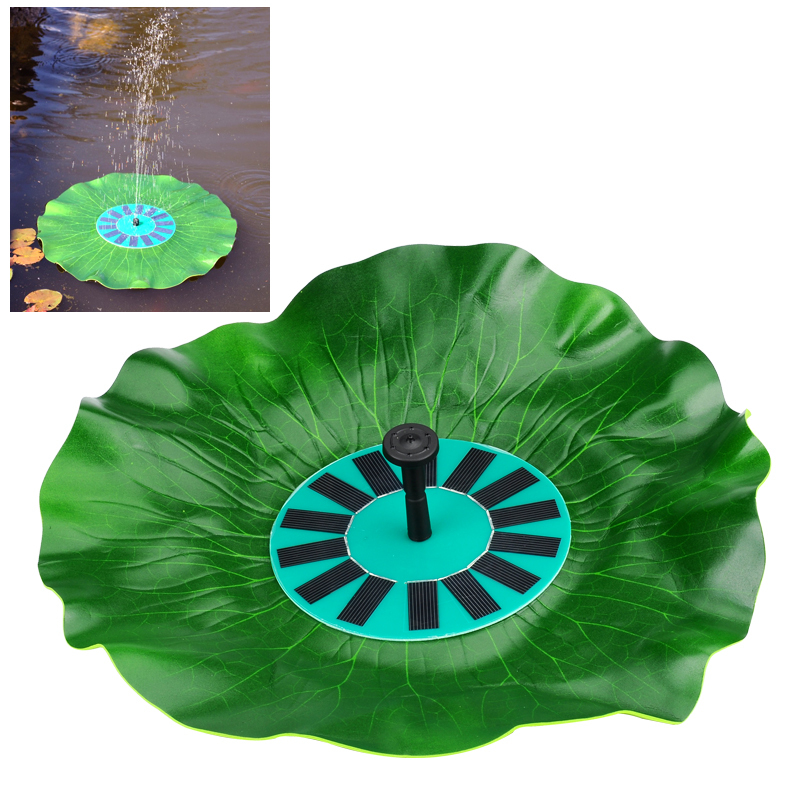 The Solar Powered Decorative Fountain “Lotus Leaf” comes with a 12 months warranty, brought to you by the leader in electronic devices as well as wholesale solar powered fountains..